How do you get a small town on the big screen? Easy, right? Atlanta, Georgia has the third largest film industry in the country. As a result of this fast-paced growth, the industry now stretches beyond the Atlanta perimeter and into the area’s booming suburbs. The quaint suburb of Norcross is located just 20 miles from downtown Atlanta and is a hybrid of historic charm and sprawling suburbia — a perfect combination for filmmakers. Its rich variety of well-kept historic homes have provided the city and its economic division the ability to promote its charm to filmmakers and producers, who have come in multitudes the past few years. With so much untapped potential, yet no existing product to further promote the southern richness of this modern suburbia, the city of Norcross reached out to the UGA New Media Institute for help. That’s where Film Norcross comes in. Film Norcross’ solution is to help provide Norcross achieve widespread visibility of its film industry in the form of a mobile application aptly named Film Norcross. In a world driven by iPhones and mobile devices, the application will help put a small town on the big screen. 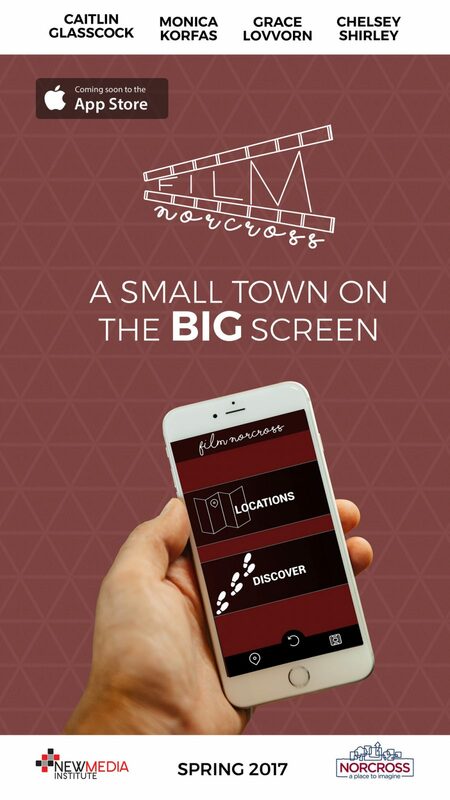 Film Norcross’ discovery mobile application utilizes location services and rich multimedia in order for users to discover films and their corresponding locations within the city of Norcross. With an integrated map view, remote users will be able to be directed to Norcross and its different filming landmarks. What makes this application a little different from similarly-existing apps of comparable cities (including adjacent suburbs Roswell and Marietta) is that Film Norcross implements different multimedia elements, including 360° photo/video and drone footage. Film Norcross and its team believe these features will provide a true discovery app to allow users an authentic interactive experience, in comparison to basic information and photos of a city’s landmarks. Ideally, Film Norcross will have a lasting effect for the city of Norcross, its economy, existing film industry, and its cultural wealth. First, Film Norcross may potentially provide an impact not only on the local level, but may further its impact socially, personally and–ideally–globally. Film Norcross is a rich resource to continually increase the tourism within the city, all while enriching and preserving Norcross’ existing film industry to lead to future growth. A huge thanks from the Film Norcross team goes out to the City of Norcross and Perkins + Will architectural firm. Both organizations have gone above and beyond with providing help and resources for the Film Norcross team. Even more, the City of Norcross and Perkins + Will are sponsoring the Spring 2017 New Media SLAM event where you can see how A Small Town Meets the Big Screen — all with the Film Norcross mobile application.